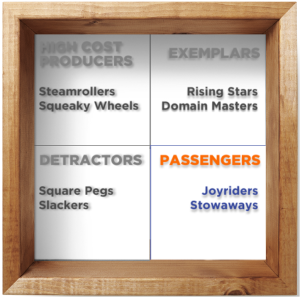 The Passenger fills a space on your organization chart but is not pulling their weight. 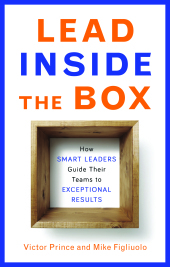 Your overall leadership goal for this box is to increase the results you get from them. Over time, you are going to increase the amount of leadership capital you invest in this box to do that. A leaders’ time and energy, their “leadership capital,” is scarce and investing it wisely is critical. Type 1 – “The Stowaways” – Stowaways show up to work. That’s about it. Not many people are sure what they do, but they appreciate that they don’t get in their way. They don’t talk much or bother you often but produce the bare minimum to stay out of trouble. They keep a low profile to avoid attention. They may travel or work remotely as much as they can. Managing them is like playing tennis with a wall – it seems like you have to do a lot of work to get something back from them. You are not sure whether they lack the skill or the will to deliver what you expect – all you know is they are not delivering. You find it is easier to do things yourself instead of asking them to do them. Leadership Strategy – “Engage” – Your goal for leading Stowaways is to get more results from them to deliver on the expectations of the role they are occupying. You should increase the amount of time you spend with them discussing the responsibilities of the job and the support they need to do it. If they cannot improve their performance enough to meet your expectations, you should shift your focus to managing them out of that role so you can get someone in it who meets all the organization’s needs. Type 2 – “The Joyriders” – Joyriders are highly engaged in the job – they enjoy coming to work and they bring a lot of energy to the office. They are social, always busy doing something, and letting people know how busy they are. They come up with all kinds of ideas of extracurricular activities to do at work and run with them in a visible, all-consuming way. The problem is you don’t see any real results in the main responsibilities they were hired to perform. In fact, it seems like their peers end up with bigger workloads because these individuals are busy with other self-identified activities and events. Leadership Strategy – “Refocus” – The goal with Joyriders is to get them producing the results they were hired to do by keeping them focused on their core duties. You first want to assess why they are not focused on the right things. Reassign or stop the extracurricular duties they are working on by asking others on the team to take on some of those responsibilities. Structure your check-in meetings with the Joyrider by focusing the agenda on the core duties of their role and their progress in performing them.